Happy Friday, everyone! It’s officially gettin’ down to the last couple days in May, so ya’ll know what that means… it’s time for another monthly favorites blog post! Before I get into everything, I just wanna say something really quick. When I do my monthly favorites (actually when I do pretty much all of my blog posts) I like to use drugstore or relatively available and non-expensive products. I do this because I wanna include everyone, no matter their money situation. A few years ago when money wasn’t easy to come by for me, I would watch makeup tutorials on YouTube and I would always get so disappointed because they never used any drugstore products, making all of the looks they created difficult for me to figure out. I never want anyone else to feel like that, so I just prefer to use products that I love, can be found almost anywhere, and I know ya’ll will love too! Of course, if you ever have any questions about any high end products, don’t be afraid to ask! 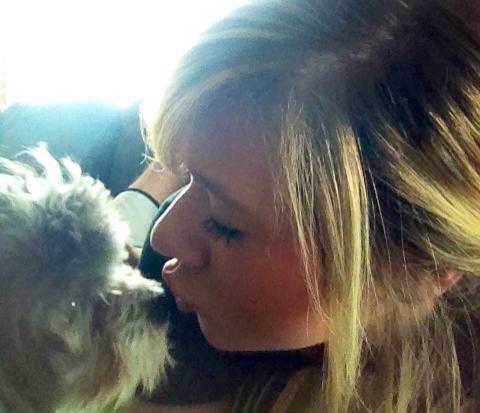 I just won’t typically do a blog post including them. 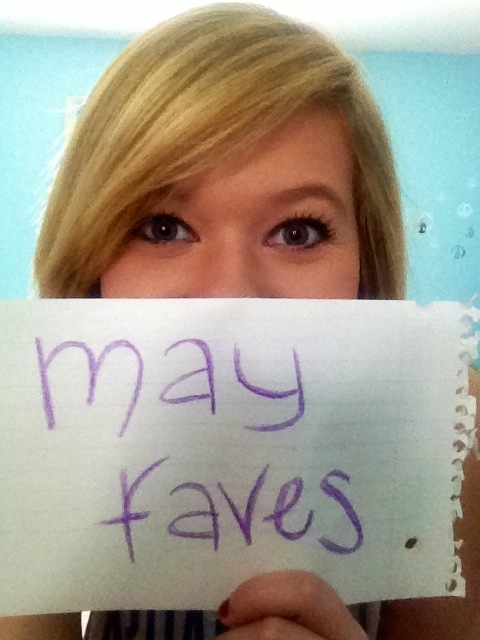 So, with that outta the way, let’s get to my May favorites! While we’re on the topic of moisturizing, let’s talk about Maybelline Baby Lips! I’m obsessed with this line. Baby Lips and EOS lip balm are my favorites and I especially love this line because these Baby Lips lip balms have some sheer color to them that are just gorgeous for the summer months! This pretty pink color is Pink Punch and it tastes and smells like strawberry lemonade. Uhmm, yes please! 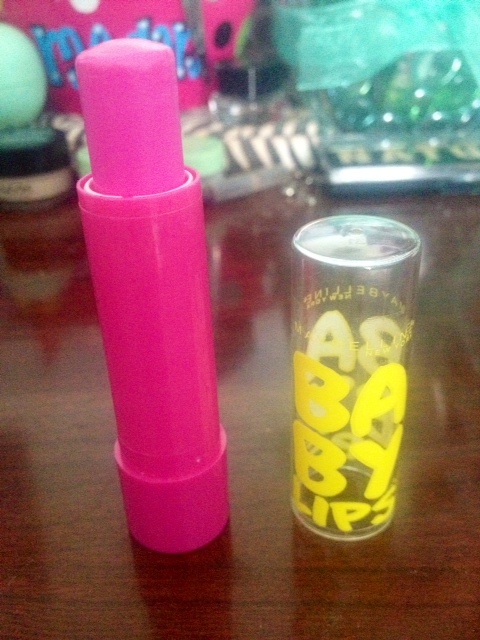 If you guys haven’t tried Baby Lips before, I really have no idea what you’re waiting for! They’re widely available, cheap, and really keep your lips soft! Plus the adorable packaging is to die for. Ya know what I just realized? 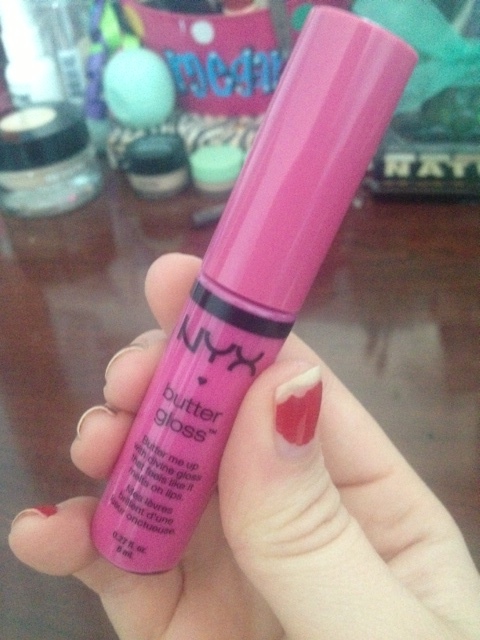 I believe I’ve included these Nyx Butter Glosses before in another one of my monthly favorites. Apparently, I’m just full of repeats today. haha But this color is one that I just recently purchased, so I know I haven’t done this specific one yet. This is a gorgeous berry colored gloss called Strawberry Parfait. Here’s what Strawberry Parfait looks like on! I tried to pucker my lips a little bit so you could see it better, but I ended up looking like I had a partial face paralysis hahah Excuse my extreme lack of photogenic skills. Anyway, what I love most about this Nyx Butter Gloss line is that these glosses never dry my lips out and they never feel heavy. They’re just light and give you the perfect amount of shine and color! These can be found wherever Nyx products (I always get mine at Ulta) and they’re for under $5. I don’t know what it is with me and my little mascara obsession, but I go through mascara like it’s no one’s business. Once my mascara even dries up just the slightest little bit, I throw it away just so I can go try a new one. haha I can honestly say that I’ve never once bought the same mascara twice. I’ve never found one that just blows me away (if ya’ll have any recommendations, let me know!). 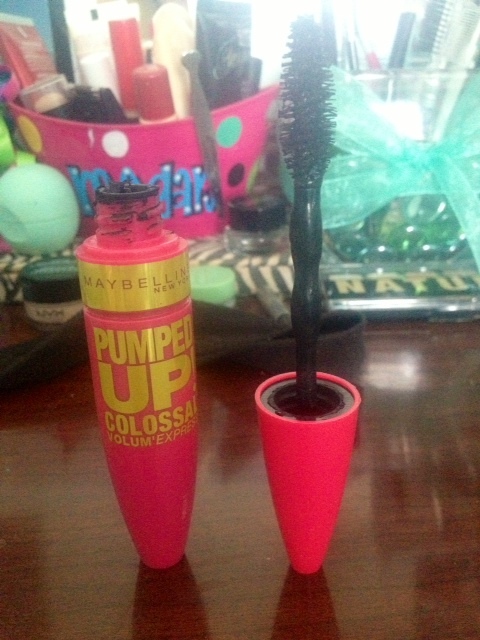 This is the Maybelline Pumped Up Colossal Mascara in black and, while it doesn’t blow me away, I have enjoyed using it. It takes some time to get used it because you can’t just go in like you would with other mascaras. This clumps and gets that spidery look really easily, so you need to go in with a really light hand and build gently from there. I don’t remember how much this one costs (I usually just grab drugstore mascaras without even looking at the cost haha) but I got mine at Walmart and I can assure you it was under $5. Would I ever purchase this again? Nahh, probably not. 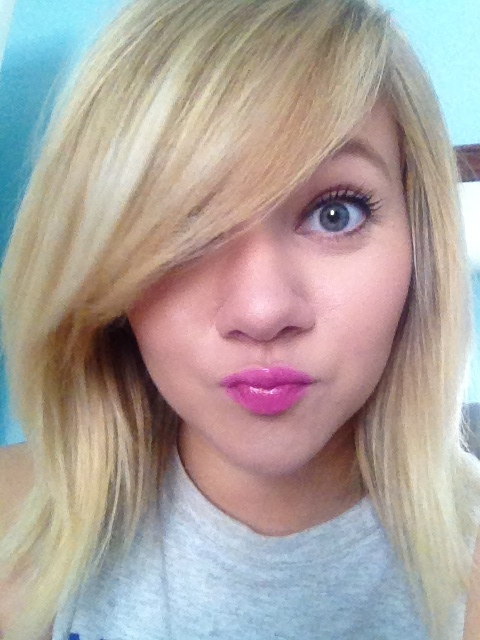 But I included it in my May favorites because it’s been my favorite mascara to use this month! 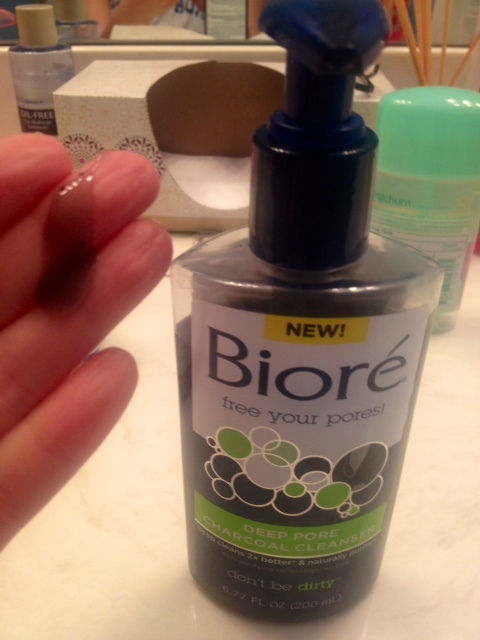 You guys, I am sucha freak when it comes to Biore products. I know I am and I know it’s bad haha I’m pretty sure I include another one of their washes and scrubs every single month. I even did a whole post about Biore a few months ago, so check that out here: https://psmeganelizabeth.wordpress.com/2014/04/15/my-tried-and-true-skincare-line/. This is their new facial cleanser that I picked up at the beginning of this month and I’ve been absolutely loving ever since! This is their Charcoal Pore Unclogging Face Cleanser and I believe it was a little over $5 available at any drugstore. In this picture, I pumped some out on my hand for ya so you could see that it really is charcoal! (Charcoal is proven to be a really amazing skin cleanser.) One of the things I love most about this is that you can use this all over your body, not just your face. If body breakouts are a problem for you, this is a wash you need to try out! Especially during the summer time when you have extra sweat, oil, dirt, and chlorine stickin’ to ya. After you use this, you’ll instantly notice a difference in your skin. You’ll be able to tell how deep down it cleaned and you’ll be left with a really fresh, clean feeling. The only thing is make sure that you follow up with a moisturizer because this can sometimes tighten your skin. I hate the Kardashians. I’ll be the first to happily admit that. I think they’re annoying, spoiled, selfish people and I genuinely can’t stand any of them. But Kim’s wedding dress? I’m pretty sure we can all agree how elegant, classy, and gorgeous it is on her. I was 100% expecting her to come prancing down that isle in a tight, low-cut dress with a slit up to her lady muffin in 8 inch heels. Obviously, I was pleasantly surprised! I still hate the girl, but her dress deserved a spot on my May favorites list! I hope ya’ll enjoyed this monthly favorites post! Remember, if ya’ll have any mascara recommendations (or any other products you think I should try out! ), please let me know in the comments! I’d love to hear what you’re favorites are. As always, don’t forget to like this post and then give me a follow if you aren’t already for more beauty and lifestyle related posts like this one (: Thanks so much for hangin’ out with me for a little bit today and I’ll talk to ya’ll later! Enjoy your weekends! 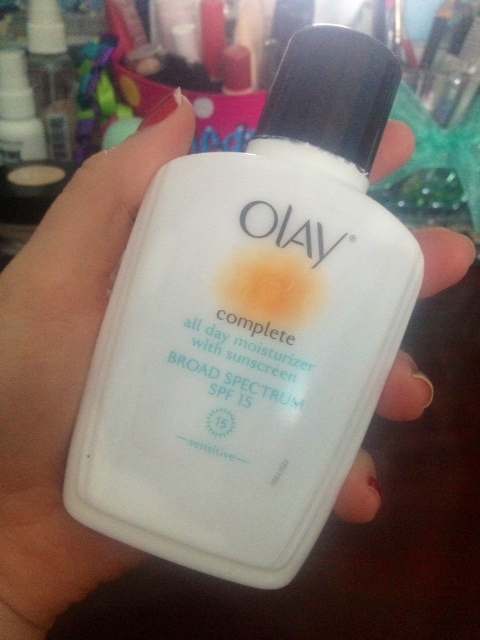 I also love that Olay moisturizer, and that Biore cleanser is amazing! I noticed a difference in the size of pores on my face right away, and I’ve just become obsessed with it haha. Yes! I use a toner from Olay that has witch hazel in it, and I just love it.